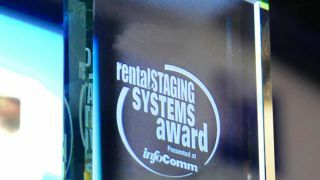 Voting for the 2017 InfoComm Rental & Staging Systems New Product Awards is now open. Go online now to vote for your choices. Click here to vote. We’ll be announcing the InfoComm Rental & Staging New Product award winners and presenting the trophies at InfoComm 2017 in Orlando in June — and of course covering the winners online and in the printed magazine. But not before you vote (deadline to vote is May 10th). LG’s Dual-View Flat OLED display is a razor-thin, dual-sided display with perfect blacks and incredible color. The space-efficient, two-sided design provides customers with three different installation options: ceiling suspension, wall-mount and floor stand. Each screen boasts Full HD (1920 x 1080) resolution, showcasing a bigger, bolder and more lifelike viewing experience to capture consumer attention effortlessly. High-performance system-on-a-chip (SoC) and an internal memory capacity enable perfect FHD-synced playback without the need for PCs or media players. The display has the unique ability to swap and mirror content on each screen with a simple press of a remote control button. The EX341R curved display is an ultra-wide, commercial-grade monitor sporting a 21:9 aspect ratio, providing users with an immersive experience for command and control and production applications. RapcoHorizon's BTIBLOX is a unique and essential tool for DJ's, presentations, Houses of Worship, recording studios, live events, and pro audio. The BTIBLOX quickly and conveniently pairs with Bluetooth music players including smart phones, tablets and computers. The pocket size device operates on phantom power or also by its own internal rechargeable battery. The Insight Laser is a true 4k in Resolution (4096 x 2160) projector and produces 25/27K lumens. The NP-PA653UL is the world’s first filter-free LCD laser projector. Giving users 20,000 hours of maintenance-free performance. Delivering the 6,500 lumens, the projector is ideal for schools, museums, corporations, retailers and more to show clear, readable images and high, consistent light output. Casio’s LampFree XJ-UT351WN Ultra Short Throw projector is ideal when renting meeting rooms in hotels with its two HDMI ports, dust resistant design and ability to generate large images over a very short projection distance. It provides an output of up to 3,500 lumens, yet doesn’t impact a presenter even if they’re standing close to the screen. The hybrid Laser and LED light source eliminates the need for expensive and hazardous mercury lamps while delivering a 20,000 hour estimated operating life. The wireless adapter (optional) gives users the ability to control the projector from a smartphone or tablet through Casio’s C-Assist app. The 3D capable E-Vision LASER 10K produces an impressive amount of lumens delivered through DPI’s 20,000+ hour laser illumination technology which is engineered to provide both high brightness and excellent color performance for the long term. The E-Vision LASER10K's brightness is backed by an impactful 10,000:1 contrast ratio, maximizing the on-screen dynamic range of any displayed content. In addition, the E-Vision LASER 10K projector can be oriented in nearly any position for unsurpassed installation flexibility. This allows DPI’s customers to place rich, large-scale imagery in practically any venue on any projection surface, without sacrificing projector performance, reliability or image quality. The EC-200 model is a full sized control package solution for any midsized multi or widescreen Live Event situation. The stand alone controller, which features a Linux-based operating system and a built-in Central Processing Unit (CPU), runs on the same software as our other Event Master systems and is a seamless upgrade for direct tactile access to operations. The new Wings Engine Stage is a technologically advanced media server system featuring a solid hardware platform, automatic camera based softedge and warping calibration, as well as DVI/3G-SDI Live inputs and virtually no resolution and content limitations. It features a very robust housing built from stainless steel. The Wings Engine Stage now features an improved system architecture that is even more shock absorbent and is truly fantastic for all rental and staging environments. It has a more powerful processor and new display port outputs, in addition to framelock and genlock inputs. The new MonoClip projection screen combines all of the advantages of our highly acclaimed Monoblox mobile projection screens with the added feature of a full clean profile without studs and press snaps. The MonoClip's entire frame block unfold and the snap joints lock automatically for an ultra fast set-up process, which means that no parts can get lost during set-up. The MonoClip vinyl surface can be stretched easily and attached to the frame with our patented QuickClip hooks. This gives the surface a perfect mat, seamless and fit accurately to the projected image. From quote to invoice, asset control to labor management, accounting integration to warehouse management, IntelliEvent Lightning provides a cloud-based tool to help companies increase sales, productivity, and profitability. Rental, sales & integration, service, hotels, venues, universities, production companies, and more have benefitted from IntelliEvent Solutions for more than 20 years. IntelliEvent Lightning Enterprise is a cloud based software solution designed specifically for the larger companies in the Rental & Staging community. Offers the best of breed technology stack, API integration with any 3rd party cloud service, such as accounting, signature, freight, ERP, CRM, tax services, HR, RFID, and more, with best-inclass customer support, custom development, account management and project management. Flex Rental Solutions provides web-based, customizable rental management software. Flex Rental Manager 4.21.1, released March 29, 2017, works with all common operating systems and browsers with a Flash plugin. Flex provides powerful tools for modeling inventory the way you use it, supporting virtual items, road cases, racks, and both rental and retail inventory. Unlimited users can have unique permissions through customizable user settings. Flex offers contact management, financial management with optional QuickBooks TM integration, crew scheduling, barcode scanner support, integration with Facebook events and Google calendar, intuitive search abilities, drag-and-drop functionality for building quotes, subrentals, transfer orders, and more. Best Rental Management SoftwarePoint of Rental’s Customer Rewards app, a rental industry first, allows rental stores to make lifelong customers and build brand loyalty. Managers define percentages of each type of income to reward customers with. Rewards will then automatically accrue in each customer’s account with each rental. Managers can also set expiration dates, heightening immediacy about returning. All of this is handled by the system, which notifies the counter person when rewards are available to be applied to a current contract. With nearly half of event planners basing their rental store decision on a relationship with the store, Customer Rewards helps build that relationship. The Epson Pro L25000U installation laser projector combines a sealed optical engine with a laser light source and inorganic components for outstanding image quality, durability and reliability with up to 20,000 hours of virtually maintenance-free operation. The Pro L25000U offers 25,000 lumens of color brightness and 25,000 lumens of white brightness. Kiva II is a new ultra-compact modular line source that adds 6dB of max SPL (138dB peak) versus its predecessor, maximized amplifier density with 16-ohm impedance, and a sturdy cabinet design. L-Acoustics’ Wavefront Sculpture Technology™ gives the product a long throw capability and delivers even SPL from the front row to the back of the audience. Its coplanar transducer arrangement and new K front grill generate a symmetric horizontal coverage of 100 degrees without secondary lobes over the entire frequency range. Weighing only 31 pounds (14kg), Kiva II’s elegant lines and flush-fitted rigging allow it to melt into any architecture. LINA is the smallest loudspeaker in Meyer Sound’s LEO Family, combining flexibility and portability with extended headroom and linear response. Measuring only 20.3 inches wide and weighing 43 pounds, LINA contains two 6.5-inch long excursion drivers, a 3-inch diaphragm compression driver, and a three-channel class D amplifier. LINA’s exterior footprint matches the prior MINA line array loudspeaker, allowing use of the same rigging hardware. On the inside, LINA has been re-engineered with a more efficient amplifier, an upgraded power supply, a new HF magnet structure, and Native Mode processing for fast “out of the box” setup of common array configurations. SD12 is set to raise the bar in terms of what users will now expect from a compact, affordable, multi- application digital console. Not only is SD12 a true sonic powerhouse, it also benefits from dual 15-inch touch screens, never before seen on a console in this price bracket, and is the first in the SD Range with built-in recording interfaces; which makes Virtual Soundchecking very straightforward indeed.The SD12 allows for connectivity with multiple protocols including Dante, Hydra 2, Optical and MADI. KLANG:fabrik in-ear monitoring, combines the finest HD audio algorithms with a multitude of flexible audio interfaces (i.e. MADI, Dante, ADAT) in order to work with professional mixing desks and stage boxes of any kind. Up to 16 people on stage receive their individual 3D mixes with one KLANG:fabrik. If you need more mixes, simply daisy-chain multiple devices, without any noticeable latency. Use app on any device (iOS, Android, Windows or Mac), or the faders of your mixing desk to control KLANG:fabrik from where you are. UN551S is a large-screen display with 0.9mm of inactive border around the panel. A new build allows the glass of the panel to go all the way to the edge of the display reducing the image gap between neighboring panels. LG’s In-Glass Wallpaper OLED solution, available in both standing and hanging versions, allows businesses and venues the freedom to utilize signage in their space as effectively as possible. Boasting accurate color reproduction, limitless color contrast, Full HD picture (1920 x 1080) and wide viewing angles perfect for any high-end installation, the LG In-Glass Wallpaper OLED display represents a whole new way to display eye-catching content for an unparalleled viewing experience. Designed with dual-sided, razor-thin OLED panels just 3.65mm thick within a glass pane, LG’s In-Glass Wallpaper OLED also offers a sophisticated touch to any application. Featuring a 16:4.5 wide screen stretched display, the Samsung SH37F enables effective communicate information in small, narrow spaces. SH37F displays are an invaluable asset in keeping customer or event attendees apprised of changing schedules providing clear, easy to read, vibrant information that can be consumed at a glance. The ZaniPlayer bridges the gap between a media server and digital signage player. Designed to do everything a simple media player cannot, such as: realtime crossfades of videos, asynchronous attraction loops, frame accurate video jumps, logo overlays, synchronized show control, custom resolutions, support for alpha channels, interactivity with input devices, and even the ability to warp and blend outputs in real-time. ZaniPlayers come in several flavors as a warping player, timeline server, stereo player, and a full 4K server, all 100% solid-state. The power of a full blown media server with the size and price point of a high-end digital signage player. Go the voting site, to vote.